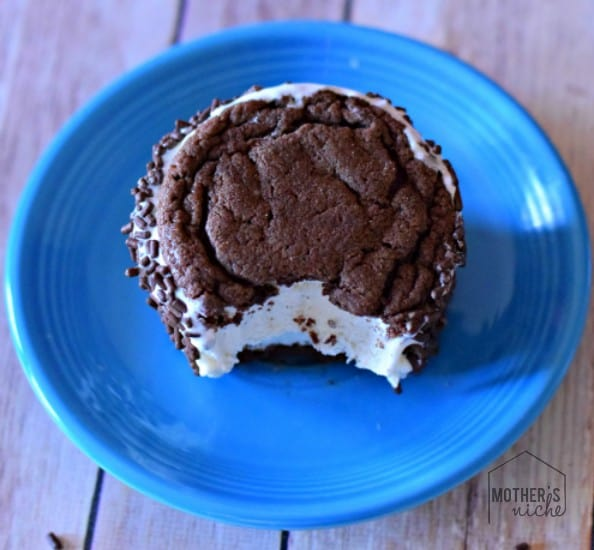 Homemade Oreo Ice Cream Sandwiches (They Stay Soft)! January 6, 2015 By Tina M Leave a Comment This post may contain affiliate links. Read my disclosure policy here. Okay, beware folks. 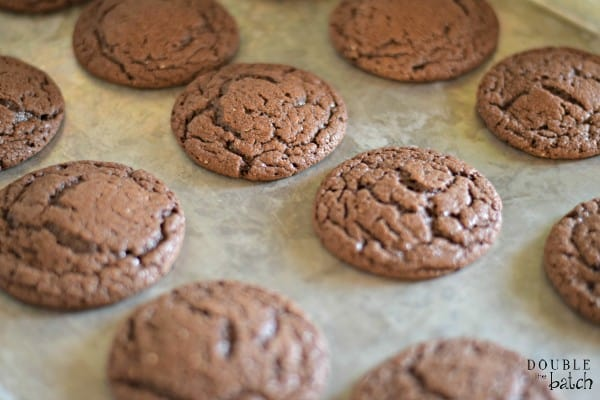 This recipe might just make you popular amongst friends, or maybe just your husband and kids, but either way…these suckers are amazzzing! I have always been addicted to my sister-in-law’s famous homemade Oreos. Her recipe seems to be the best that I have tried and the batter is done before the oven preheats! They are so easy. And so soft. And so addicting. One day I had the thought, “I wonder what would happen if I put ice cream in the middle of some of these? So I did. And after eating 2-3 of them, I put the rest in the freezer before I went into a sugar coma. Although they were delicious when I first made them, I was more impressed with what they were like after being in the freezer for a few days. STILL SOFT! Same softness you would find in the ice cream sandwiches you buy at the store! Step 1: Make the cookies (minus the cream cheese frosting) from this recipe: Homemade Oreos (Hint, it’s only 3 ingredients. Easy). Step 2: While the cookies are baking and cooling, cut out your ice cream circles. I just cut my ice cream into sheets (I cut right through the carton), and then used a mason jar lid to guide me on size. I cut around the circle with a knife and placed them on a cookie sheet, or in a baggies (I’ve done both). You can also place a piece of saran wrap into muffin tins and press scoops of ice cream into the muffin tins, or you can do the same thing using ramekins. 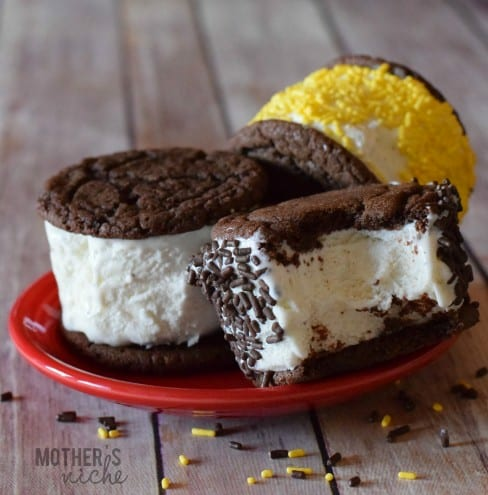 If the ice cream is really soft, you can also just scoop in onto the cookie, and place the cookie sandwich in the freezer. That’s the great thing about this recipe, the cookie can go in the freezer and it doesn’t go hard! 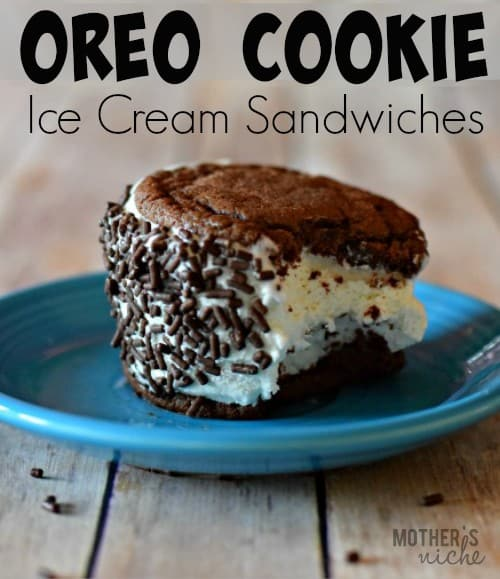 So you can pre-make them entirely, rather than having to keep the cookies and the ice cream circles separately.